ValveSupplies is a Lower Hutt based importer and distributor of a range of products in the plumbing industry. For a number of years they have operated a successful nationwide mail order operation. The client wished to create an online catalogue so that orders could be placed online. 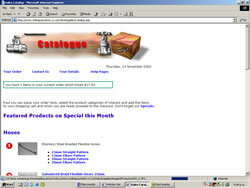 We built a site entirely in Macromedia Ultradev using ASP. As it is a dealer to dealer site the whole area is password protected. Content to all of the pages is fed from a database which the client can update via an online form. Orders are processed online with email notifications being actioned automatically. The client also has the ability to send out mass emails, or to place notices on individual dealers viewing pages.